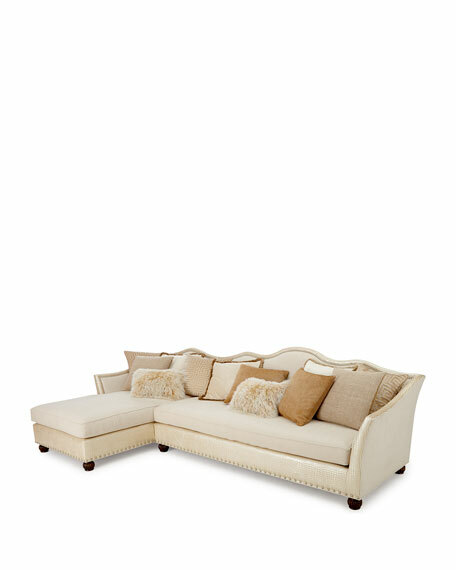 Massoud Regina Left-Chaise Sectional 146"
Handcrafted sectional includes right-arm sofa (arm on right as you face the sofa), left-arm chaise (arm on left as you face the chaise), and 10 toss pillows. Upholstered in polyester/rayon, rayon, and polyurethane/cotton fabrics. Pillows covered in rayon, leather, polyester, and Tibetan lamb. Sofa section, 99"W x 47"D x 45"T; chaise section, 47"W x 81"D x 41"T. Seat, 20"T; arms, 31"T.
For in-store inquiries, use sku #1622686.